Exterior. The London Eye, central London. A van is parked nearby. Zoom in to VAN INTERIOR. A projector, some seating, two men. Zoom out to VAN EXTERIOR. Focus on big sign on the side reads CANNES IN A VAN. Roll opening credits. Cannes in a Van is the event in the film festival calendar where the smallest mobile film festival roars into the midst of the biggest static film festival in Europe. Two men with a projector, a van, a massive pile of short films and a passion for shaking things up at Cannes, the biggest, boldest, most blinging film festival in Europe will be kicking off their journey from here to there tonight. You are cordially invited to join these plucky maverick movie moguls for farewell drinks as they prepare for their long drive. Head over to the Movieum in County Hall on South Bank, the delightful new-ish movie museum we wrote about when it opened in February. The send-off party starts at 7pm and the van with its cargo of independent short films will set off at 10pm - so get there before the plucky chaps toot their horn and rumble away. We wish them the best of luck for their guerilla way of bringing the best of independent film to Cannes. You are strongly advised to go a-knocking if the van is a-rocking. And we're quite certain it will be rocking. Bon voyage! 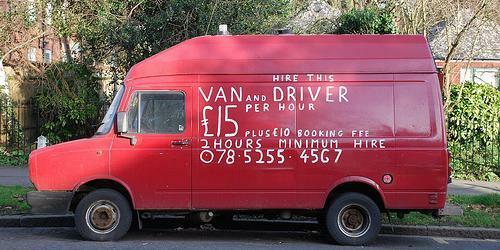 Cannes in a Van farewell drinks party, 7-10pm tonight, Movieum at County Hall. For more information about the party and Cannes in a Van, go to the website here. Image courtesy of Doilum from the Londonist Flickr pool.